Our location on Highway 71, just an hour North of International Falls, Minnesota, or an hour South of Kenora, Ontario, makes Larsson's Camp a convenient and easy to find vacation getaway. Follow Highway 11 West for approximately half an hour, until you reach "J.D. Junction". Turn right (North) on Highway 71. Travel North for approximately half an hour. You will see a sign for Larsson's Camp on your right hand side. We are located a half mile North of this sign on the left hand (West) side of the Highway. If you reach the town of Nestor Falls you've gone about 5 minutes too far to the North. Exit Kenora past Sunset Husky on the South end of town. Continue until you reach Highway 17. Turn right and follow Highway 17 East for approximately 5 minutes until you reach the junction of Highways 17 and 71. Turn right (South) on Highway 71 and proceed for approximately half an hour. You will reach the town of Sioux Narrows, Ontario. Continue South on Highway 71 for approximately half an hour. You will reach the town of Nestor Falls, Ontario. Continue South on Highway 71 for approximately 5 more minutes. 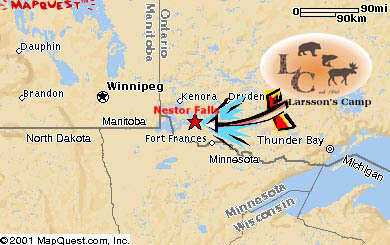 We are located just South of Nestor Falls, on the right hand (West) side of the highway.